Our hard-working and specialized team is ready to safely and effectively complete your water restoration needs. Our professionals are specialized in water damage repair from any home or business environment in Atlanta, GA. We understand that misfortunes can happen, a pipe may freeze, your plumbing goes bad or your fire sprinkler system malfunctions and you have water everywhere. Whatever the cause, we are here to help. Its a technique to repair the damage of a house or property back to the pre-loss conditions. The damage tends to be caused by flood, overflow or water system malfunction. This procedure incorporates a few different techniques, one example is to view the water disease levels, evaluate the issue, purify and dry the structure, verify the procedure and complete of that procedure. To include, as a rule the most trusted affirming bodies are – Cleaning and Restoration Certification (IICRC) and the Restoration Industry Association (RIA). They legitimize the standards for water damage restoration through their proposal. Immediate response is essential when flooding has occurred at your home or commercial facility. The effects of water damage on a home or business can be devastating and incur future expenses for varying issues. Unmitigated flooding can cause wood rot, rust, odors, mold, and other types of property destruction, so time is of the essence. Naturally, you are going to have a lot of questions. Most property owners aren't familiar with the essential steps for proper restoration. That’s where the ARA water damage contractor comes in. We will work one-on-one with your insurance company to get your home back to its pre-loss condition. If your project does not involve an insurance carrier, we’ll provide you with a detailed competitive quote. What to do if Water Damage is found? Water Restoration should only be handled and/or removed by trained professionals. If water damage or flooding should occur in your home or place of business, then immediately give us a call at 404-760-8144. Our team of specialist will inspect problem and take the necessary steps to get your place back to it's pre-loss condition. 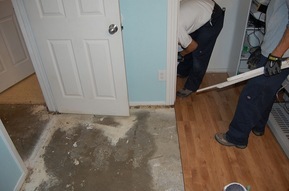 Before you have your home or business remodeled, you should find out whether water damage is present. If you find damaged material containing mold or related debris you should immediately isolate the area (keep pets and children away) and give us a call.